It may be recalled that a budget with reference to planning and control refers to a comprehensive and coordinated budget generally known as master budget. In operational terms, a comprehensive or overall budget has several components. A master budget normally consists of three types budgets: (i) Operating budgets, (ii) Financial budgets. and (iii) Special decision budgets. Another classification of a master budget is (i) Fixed/static budget and (ii) Flexible variable sliding budget. In the discussions that follow it illustrate the preparation of the various components of a budget, namely, operating and financial budgets. The mechanics of the preparation of a flexible budget is also discussed. 6. 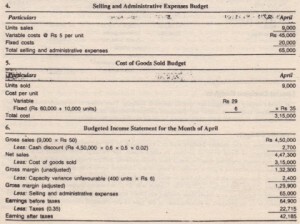 Administrative and selling expenses budget, and so on. 2. 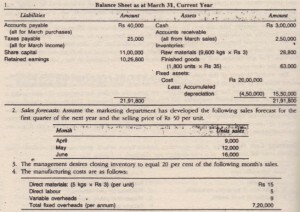 Budgeted statement of retained earnings. The principal aim of the cash budget, as a tool of planning, is to ascertain whether, at any time, there is likely to be an excess or shortage of cash. The preparation of a cash budget involves various steps. The first element of a cash budget is the selection of the period of time to be covered by the budget. Alternatively, it is referred to as the planning horizon. The planning horizon means the time Span and the sub-periods within that time span over which that, cash flows are to be projected. There is no hard and fast rule. The period coverage of a cash budget will differ from firm to firm depending upon its nature and the degree ,of accuracy with which the estimates can he made. As a general rule, the period selected should he neither too long not too short. If it is too long, it is likely that the estimates will be upset as we cannot visualize them at the time of the preparation of the budget. If on the other hand, the time span is too small. the disadvantages are: (i) Failure to take into account important events which lie just beyond the period covered by the budget: (ii) Heavy workload in preparation: and (iii) Abnormal factors that may he operative. The planning horizon of a cash budget should be determined in the light of the circumstances and requirements of a particular case. For instance, if the flows are expected to be stable and dependable, such a firm may prepare a cash budget covering a long period, say, a year and divide it into quarterly intervals. In the case of a firm whose flows are uncertain, a quarterly budget divided into monthly intervals may he appropriate. Where flows are affected by seasonal variations, monthly sub-divided into weekly or even daily budgets may be necessary. If the flows re subject to extreme fluctuations, a daily budget may be called for. The idea behind sub-dividing the budget period into smaller intervals is to highlight the movement of cash from one sub-period to another. The sub-division will provide information on the fluctuations in the cash reservoir level during the time span covered by the budget. The second element of the cash budget is the factors that have a hearing on cash flows. The items included in the cash budget are the cash items only, non-cash items such as depreciation are excluded. The factors that generate cash flow are generally divided, for purposes of constructing a cash budget, into two broad categories: (a) Operating and (b) Financial. 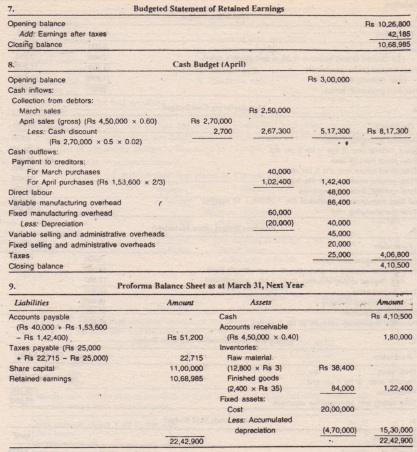 This two fold classification of cash budget items is based on their nature. 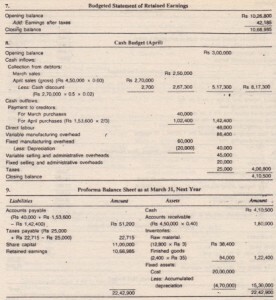 While the former category includes cash flows generated by the operations of the firms and are known as the operating cash flows, the latter consist of me financial cash flows. 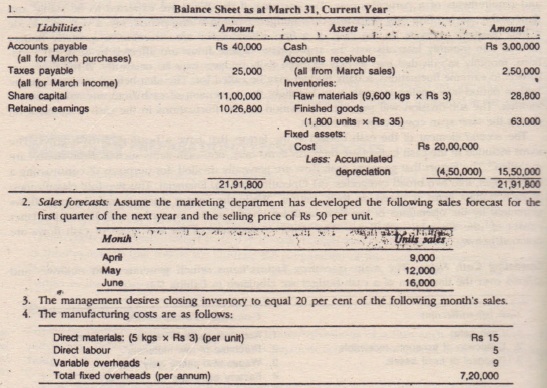 The major components of the two types of cash flows are outlined below. The main operating factors/items which generate cash out|flows and inflows over the time span of a cash budget are tabulated in Exhibit. Among the operating factors affecting cash flows, the collection of accounts receivable (inflows} and accounts payable (outflows) are the most important. The terms of credit and the speed with which the customers pay would determine the lag between the creation of the accounts receivable and their collection. Also, discounts and allowances for early payments. return from customers and bad debts affect the cash inflows. Similarly, account payable relating to credit purchases are affected by the purchase terms. The major financial factors/items affecting generation of cash flows are depicted in Exhibit. 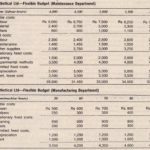 After the time span of the cash budget has been decided upon and pertinent operating and financial factors have been identified, the final step is the construction of the cash budget. The preparation of the master budget is illustrated in Example. The following data relate to Hypothetical Limited. 5. Normal capacity is 1,20,000 units per annum. Assume absorption costing basis. 6. Each unit of final product requires 5 kgs of raw materials. Assume management desires dosin material inventory to equal 20 per cent of the following month’s requirements of production. 7. 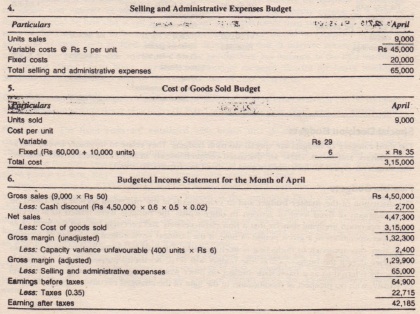 Assume fixed selling and administrative expenses are Rs 20,000 per month and variable selling and administrative expenses are Rs 5 per unit sold. 8. All sales are on account. Payment received within 10 days from the date of sale are subject to a 2 per cent cash discount. In the past, 60 per cent of the sales were collected during the month of sale and 40 per cent are collected during the following month. Of collections during the month of sale 50 per cent are collected during the discount period. Accounts receivable are recorded at the gross amount and cash discounts are treated as a reduction in arriving at net sales during the month they are taken. 9. Tax rate is 35 per cent. (a) All purchases are on account. Two-thirds are paid for in the month of purchase and one the following month. 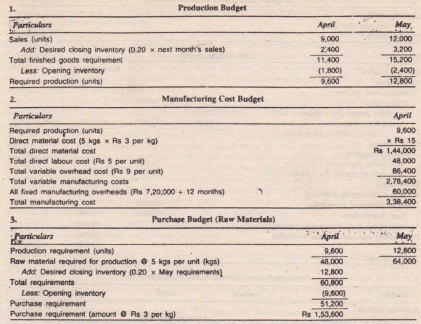 (b) Fixed manufacturing costs include depreciation of Rs 20,000 per month. (c) Taxes are paid in the following month. (d) All other costs and/or expenses are paid during the month in which incurred. From the foregoing information prepare a master budget for the month of April only. The third category of budgets are special decision budgets. They relate to inventory levels, break-even analysis, and so on. These are discussed comprehensively in other chapters of this volume. The long-term capital budgets are covered.